What can change in an instant? Jean Grey has been thrust into the past, steadily drawn toward the face of the Phoenix’s Avatar: herself. The seeds of a defining moment for both of them are being sown, and her elder self takes Jean on a ride through space, showcasing one’s awesome power and the other’s frightful potential future. Jean is left with questions as another fortuitously arrives to give a glimpse into what may come. 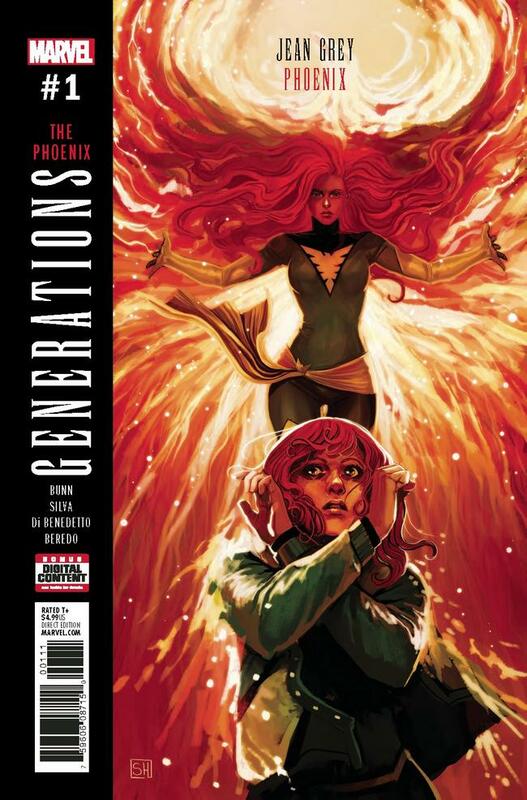 Generations: Phoenix & Jean Grey came onto shelves with a lot to live up to. Jean is an original member of the X-Men, the Phoenix/Dark Phoenix saga is one of the most well known in comics, and there’s a lot of continuity to handle with any iteration of the famous psychic. The comic hits most of these points well, tying in some small but iconic moments for the character while also adding to the confusion of the Phoenix mythos regarding its relationship with Jean from their first moment of contact. Cullen Bunn uses the younger Jean Grey as the focal point of the issue, and it is through her that we see the ever-present conflict regarding the Phoenix entity. This massive raptor of interstellar power is foreboding and nigh-omniscient, and while the older Jean uses its power to demonstrate her might and protect others, there is still the constant threat of the Force taking one of them over. However, we must also acknowledge the mixed messages of Phoenix continuity that affect how this comes across. Was Jean actually replaced? Is ‘replacement’ a metaphor for cosmic power unchecked? The reading of Jean’s interactions with her Phoenix self can vary rather drastically based on where you stand regarding the well-known retcon. Any of these meanings can be valuable, but they do also change the impact of the two Jeans’ conversations. R. B. Silva conveys many sides of Jean Grey through both representations of herself. Art captures emotionality, confusion, compassion, and force. Silva’s portrayal of a Jean of stature is a nice return to what we saw of her in the years prior to her most recent death in Morrison’s New X-Men. This Jean is visually distinct from the current continuity’s Jean. Their bodies occupy different spaces and poses: the older Jean often stands erect, her shape in straight lines, while younger Jean is drawn with angers in her body, often looking or pointing down. Though Bunn touches upon the older Jean’s own reticence as she deals with the “loss” of her friends and grasping the power of the Phoenix, it’s actually her younger self who is wrought with hesitance as she knows the future and what could possibly happen to her. These renderings better encapsulate the current Jean’s fears and Silva capitalizes on their sharing space to demonstrate the depth of those feelings. The light touch in Adriano di Benedetto’s inks, accompanied by Silva, keeps the story in an emotionally appropriate place. The duo sparingly uses deeper outlines to show young Jean as a stranger in a foreign place, older Jean as a subtle force of nature, and to hone in on particularly intense events which dot their shared history/future. Darkness takes on its own presence, but not to the extent that it overpowers the shinier elements throughout the story. With di Benedetto and Silva working together, everything has a place, immediately highlighting the technical deliberation showcased through each page and panel. Rain Beredo is no stranger to bright pallets, intensifying the telekinetic and telepathic prowess of both Jeans. The story feels almost idyllic, save for younger Jean’s introspection. To some degree, Beredo’s colors highlight the distinction between the two characters in a multitude of ways: how did their stories differ between now and over 30 years ago, who are they in this instant as people? Going with a darker, more feelings-laden scheme may have taken away from this effect and made the story feel contrived. Beredo’s touch on this comic allows many important elements to be seen at the forefront, including the brilliant display of power against Galactus. This issue of Generations is truly a spectacle. If you know the X-Men in any capacity, you are familiar with the daunting task of continuity and timeline knowledge, and this issue is no true exception to that. However, even with handling the many, MANY iterations of the Phoenix force and its relationship to Jean, we get to see multiple avenues through which to explore their story and what it means now, particularly once you get to the last panel of the issue. With art befitting a cosmic entity and writing that leaves a bevy of interpretations, Generations: Jean Grey/Phoenix may be a required read for any Phoenix buff or X-Men continuity nerd and, if nothing else, gives us a story that I imagine many may have been waiting for.